Students Transform Public Science – Christina M. Colvin, Ph.D. I teach a section of first-year composition I call “Science in Public.” The course’s thematic focus—public-facing science communication—prompts students to consider how journalists, artists, activists, researchers, and other communicators compose texts about the sciences that engage and move to action a broad, nonspecialist audience. Students adapt several of the rhetorical strategies and generic conventions of effective science communicators to craft their own public-facing texts as well: blogs, photo essays, websites, and other media. Throughout the course, we have interrogated how texts convince public audiences of the cultural importance, authority, and responsibility of science, as well as how students’ own rhetorical compositions “enter the conversation” and respond. At a STEM-focused institution like Georgia Tech, I want students to consider how their work as future scientists, engineers, designers, and communicators will often need to be explained and made relevant to stakeholders, potential employers, and interested nonspecialists. I also want students to see how their university is actively engaged in the very rhetorical work we examine all semester long. For this reason, I designed one of the course’s major assignments, the “Transforming Tech Science” project, to highlight Georgia Tech as a place replete with rhetorical texts communicating the social and cultural significance of science. Students learn, for example, that a team of Georgia Tech science communicators translates the work of Tech scientists for public audiences in order to celebrate innovations, acquire sponsorship, solicit donations, and generally showcase Tech as a productive site of scientific research. The most effective projects grappled with these issues of medium, purpose, and audience at length; effective projects also took inspiration from the existing texts and expanded those texts’ rhetorical reach. 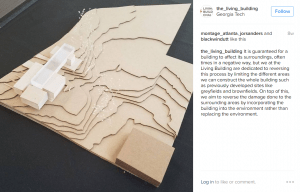 For example, one group (David Jose Fernandez and three anonymous students) analyzed a physical model for Tech’s soon-to-be-constructed Living Building—an international sustainable building certification—located on the first floor of Clough. 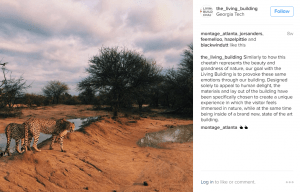 By considering the limitations of a static, physical model in depicting something “living,” the group analyzed the model as a text and transformed it into an Instagram page. 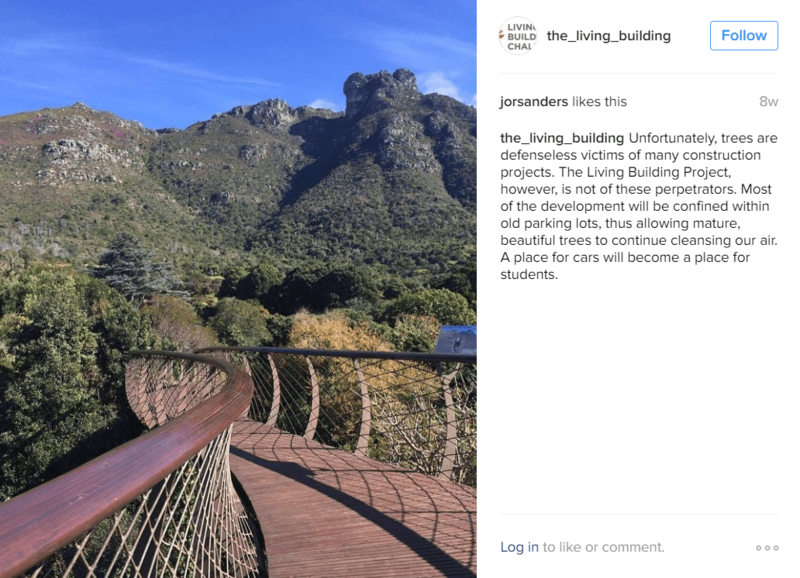 They built the page using photographs they had taken of buildings, animals, and landscapes to visually simulate the vibrant experience of nature, sustainability, and human and nonhuman activity the future Living Building promises to facilitate; you can see several of these Instagram entries above. Other groups used their growing familiarity with the interests of the Georgia Tech community to inform their transformations. One group found a years-old article reporting on a high-powered telescope used by Tech aerospace engineers—a telescope that, once a month, can be used by members of the public. The group decided to create a poster that could be digitally disseminated and displayed in locations across campus to call attention to one of the telescope-viewing nights—specifically, a night when the Ring Nebula in the Lyra constellation would be visible. The poster, shown below, combines attention-grabbing visuals and written text that informs its audience about both the advertised event and the telescope. The poster above represents one group’s transformation of an existing text that references science at Georgia Tech. 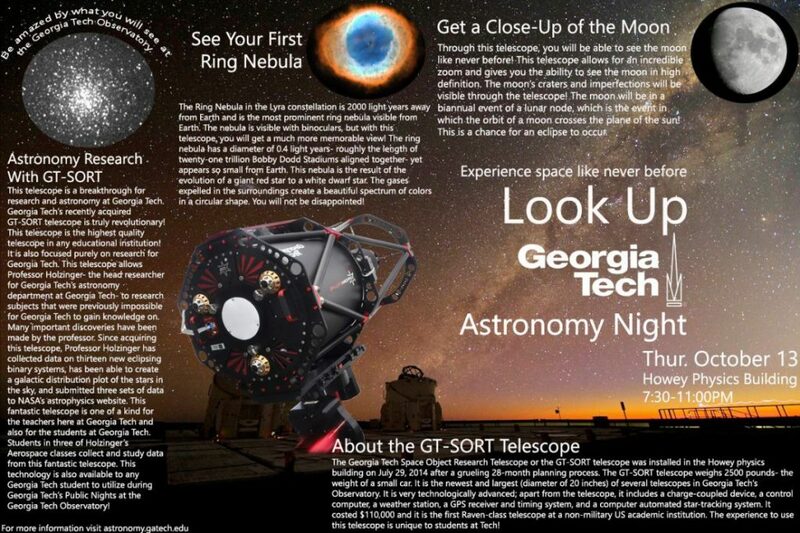 Specifically, the group of five anonymous students found a news article covering the arrival of the GT-SORT telescope and created an advertisement for an event in which the telescope could be used by the public. I was also impressed by many groups’ deft manipulation of generic conventions. One group (Connor Ford, Joe Zein, and three anonymous students) transformed a paper flyer recruiting passers-by for a brain imaging study that they found on campus. Harnessing the ethos of the Georgia Tech brand, they created a fully-functional website that demonstrates such attention to detail and intentional design that the site could easily pass as an official Tech outlet for requesting public funds. Several groups were inspired by the practical possibilities of a new textile developed by Tech researchers that uses sunlight to generate energy, as reported by a Georgia Tech News article. In response, one group (Alice Choi and three anonymous students) created a social media-destined video ad targeting college students; another (Ryan Petschek, Coleman Alfaro, Vijay Krishnan, and Jaleen Walker) performed as North Face representatives giving a live sales pitch and offering a branded product launch poster; yet another (Maitreya Venkataswamy, Daniel Wang, and two anonymous students) developed a Kickstarter campaign video, displayed below, showing off a range of products that could be constructed with the solar-powered fabric. Students’ exciting ventures into the rhetorical environments of public Georgia Tech science have motivated me to incorporate more local material into my courses. Analyzing and composing close to home, as it were, provides an opportunity to consider how our texts can serve and appeal to “real” audiences. In his discussion of ecocomposition, an approach to writing instruction that thinks through the relationship between writing and place, Mark C. Long suggests that teachers of writing communicate to students that the term “environment” means “more than discerned landscapes” and “nature.” Such an expanded understanding of environment would aim for more students to “find reasons to take their relation to their environment seriously” (137). I agree with Long’s recommendation. One of my pedagogical goals—getting students to view, through a critical lens, the myriad texts they confront every day—can be productively served by exploring the relationship between the environment of Georgia Tech and its texts. Long, Mark C. “Education and Environmental Literacy: Reflections on Teaching Ecocomposition in Keene State College’s Environmental House.” Ecocomposition: Theoretical and Pedagogical Approaches. Ed. Christian R. Weisser and Sidney I. Dobrin. Albany: State U of New York, 2001. Print.